From cranes, trucks and tractors to agricultural and construction machinery, the high-performance ro-ro terminal in Bremerhaven offers countless services for the handling and intermediate storage of rolling or self-propelled goods. Roll-on/roll-off – or ro-ro – refers to the loading of movable cargo which is then carried across the seven seas on special-purpose vessels. The transport of goods on ro-ro vessels plays an increasingly central role in the maritime shipping business and Bremerhaven is one of the leading transhipment centres in Europe for rolling cargo, handling an annual ocean freight quantity of approx. 1.2 million tons. 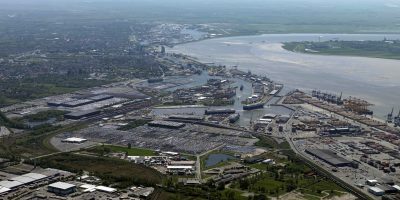 The location on the mouth of the Weser is one of the leading transhipment terminals for global ro-ro transports. The multifunctional handling facilities can offer premium conditions for the professional handling of even the largest specialist ro-ro vessels: an extensive operating area of approx. 340,000 square metres, modern equipment for the safe and fast transhipment of exceptionally heavy parts weighing up to 21,000 tons, state-of-the-art IT and good traffic connections to the European hinterland. Self-propelled heavy-lift cargoes require special handling: high-powered tractor units, strict compliance with specific load securing regulations and skilled workers who have been specially trained by the manufacturer all ensure that the terminal satisfies the stringent quality and safety standards in the high & heavy sector.